This eggless chocolate cake is a delicious not-too-sweet cake. It is simple, un-fussy and pretty quick too. The condensed milk gives it a wonderfully sweet “mithai” tone to it. I served this cake as is, sans any frosting and it was a huge hit at home. I adapted this recipe from the Morphy Richard manual. This is a great cake to try for beginners as there is no sugar to cream. The first time I made this chocolate cake I used an entire tin of condensed milk plus some more milk and ended up with mithai really. Guess what – it tasted great, really, it tasted like no other cake (it wasn’t a cake). I loved it. My sister like it a lot too. It tasted exactly like kalakand (Indian milk sweet) and it took nearly 1-1/2 hours in the oven. Knowing me you should have realized it wasn’t intentional. I read the “300 gm” condensed milk as “300 ml”. I am not usually this bad but sometimes I am. The batter was a little too runny, but some cake batters are like that, and I didn’t give it much thought. I put it into the oven and even after half an hour it kept bubbling like a kozhambu. I knew then that something was wrong and even before I looked up the recipe I somehow realized that this was what I would have done. Sometimes when you try extra hard to remember something, you forget that (do you?). 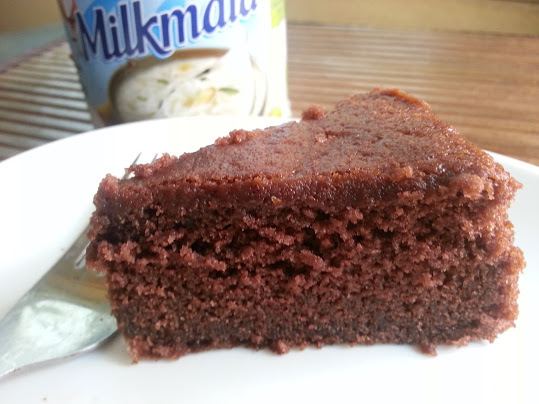 The recipe below is for eggless chocolate cake (not the kalakand). I will someday post the innovative oven baked kalakand recipe as well. 1. Grease and line a 7 inch round baking pan. Preheat oven to 170 degree centigrade. 2. Sieve flour, cocoa powder, baking powder and baking soda together twice. Set aside. 3. Mix vanilla essence and water and set aside. 4. Beat butter till soft and creamy. Add condensed milk and continue beating for 2-3 minutes till well mixed. 5. Add flour and water mixture alternately starting and ending with flour and stir to make sure all the flour is incorporated. Don’t overmix. 6. Tip the batter into the prepared pan and grill at 170 degrees centigrade for 10 minutes. Then change to bake mode and bake for 20 minutes at 170 degree centigrade. 7. Let the cake cool, remove from pan and serve. This entry was posted in Cakes, Desserts, Party Food and tagged baked, baking, cake, chocolate, condensed milk, desserts, eggless chocolate cake, no sugar, recipe. I tried your eggless chocolate cake twice. Once as a cake and the other time as a cupcake. Both turned out so well. I got lot of appreciations for that 🙂 Thanks for the wonderful recipe.